As you grow older, so do your eyelids. It is becoming increasingly popular for older women and men to get eyelid surgery in Las Vegas. As eyelids start to sag, you will look older. Your eyelids will feel heavy, and the droopiness will cause you to look tired. Eyelid surgery can change that. It may be able to take 10 years off your appearance! Your eyelids will begin to change around your 30s or 40s. The elasticity in your skin decreases, and the skins starts to stretch. The excess skin results in the appearance of droopy eyes. The excess skin may even fall over your eyelashes and obstruct your peripheral vision. A forehead lift could diminish this problem, but eyelid surgery is a less invasive way to solve the problem. Growing older can also cause your muscles to weaken. The decrease in muscle strength around your eyes can cause wrinkles and sagging. This can even cause the fat around your eyelids to protrude and create the look of bags around your eyes. This can have unpleasing aesthetic results. Take a look at your parents. Do they have sagging around their eyes? If they do chances are very high that your will too as you grow older. The aging around the eye is a hereditary trait. Fortunately, a surgical procedure can be done to restore the youth in your eyes. According to the American Society of Plastic Surgeons, eyelid surgery was the third most common plastic surgery procedure in the year 2012. The surgery corrects the puffiness around the eye by removing the excess fat and skin. A complete facelift could also correct this problem, but more people are choosing to simply undergo eyelid surgery alone. The cost is significantly lower, and the recovery time is much quicker. Prior to getting the procedure done, the plastic surgeon will examine the tissue around the eye to see if it is a medical condition causing the droopiness. If it is a medical problem, a plastic surgeon can perform a ptosis repair of the eyelid. Some medical problems of the eyelid may not be able to be corrected by eyelid surgery. To be considered a good candidate for eyelid surgery, you must have healthy facial and muscle tissue, not smoke, and not have any life-threatening medical conditions that could negatively impact the recovery process. Recovery is fairly short for people undergoing eyelid surgery. Typically, you can be back on your feet within 10 days after the procedure. Immediately following the procedure, you may experience swelling, puffiness, dry eye, bruising and irritation. This should go away with time or can be controlled with medication. If you want to get eyelid surgery, it is imperative that you go to a board certified plastic surgeon. An accredited eyelid surgeon in Las Vegas can be found at Reynolds Reconstruction. Dr. Reynolds is well-trained and can effectively restore your eye to its natural beauty. For more information about this procedure, contact our team at 702.410.9800. 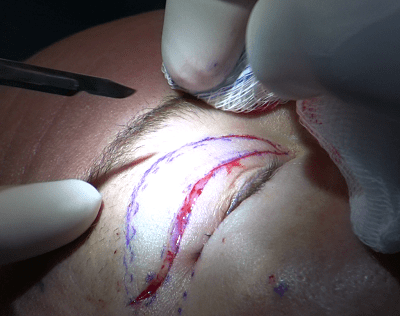 This entry was posted in Eyelid Surgery and tagged eyelid surgery, eyelid surgery las vegas on July 3, 2014 by Joseph.